DELMAR — Selkirk resident Neil Piper had noticed a deadly pattern running in his immediate family. First, his mother, Resa, passed away in June 1981, then his sister, Barbara, died in March 1992, followed by his brother, Bruce, in August 2002. The culprit responsible: pancreatic cancer. The American Cancer Society defines pancreatic cancer as “when cells in the pancreas start to grow out of control.” The organ is located behind the stomach, measuring around six inches long and below two inches wide. Insulin is among the numerous significant hormones produced in the pancreas, a glandular and digestive organ. For 2018, it is estimated that 44,300 out of 55,440 who were diagnosed with pancreatic cancer will die, and the five-year survival rate is just 8 percent. Neil, 71, remembered that after Bruce was diagnosed with the disease, Bruce began researching online for resources. He eventually came across the Lustgarten Foundation which is involved in raising both funds and awareness for pancreatic cancer and research and providing helpful information for affected people and their families. When Bruce passed, Neil continued looking into it with his wife, Shari, 68. Lustgarten is the country’s biggest private foundation dedicated to funding pancreatic cancer research, having raised $154 million already, all in hopes of discovering a cure. Also, 100 percent of donations to directly towards research, courtesy of separate funding to support administrative expenses. The couple cited these two reasons as why they continue working with Lustgarten. “After [Bruce] passed away, we thought, ‘This is not coincidental, there’s something cooking here. We’ve gotta do something about this, if not for us, but for our children,’” said Neil. 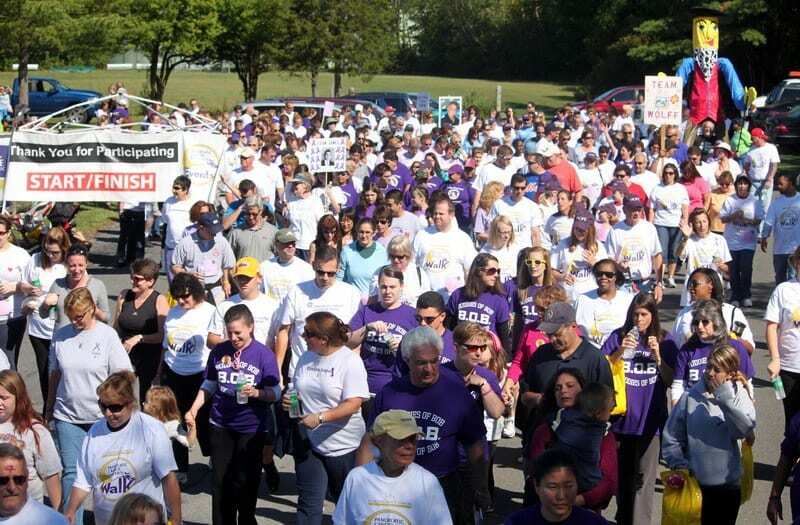 While Lustgarten is based in Woodbury on Long Island, Neil and Shari began hosting and coordinating the Lustgarten Foundation Albany Capital District Walk for Pancreatic Cancer Research annually since 2003, a year after Bruce’s passing. Elm Avenue Town Park’s large pavilion on Sunday, Sept. 16, with registration starting at 8 a.m.
Advance registration is $50, walk-up is $60 and children are $15. People who may not be able to pay the whole fee are still encouraged to show up. “We don’t turn anyone away, we’ll take anybody who shows up,” Neil said. People can also donate and register on Lustgarten’s website. The walk is preceded by a Pick-a-Prize auction, a 50/50 raffle, a Pet Parade, speeches, a ribbon-cutting ceremony to mark the start of the overall event, and other family-friendly activities. Regarding the 50/50 raffle, Neil said that the winner would receive 50 percent of the money, while the rest goes into research funding — although the winner can eventually donate their just-won money to research too. The couple also plans to have a drone film the ribbon-cutting ceremony from 30 feet high above for 20 minutes, to help get a visual scope of the turnout. Code Blue, an Albany live band, will play music and cover songs from the 1960s through 1980s. There will also be purple hair extensions (purple is the color associated with pancreatic cancer awareness), face painters, chair massages and even complimentary cider donuts, apple cider, coffee and tea. Each walker will receive a free T-shirt and water bottle. This year’s sponsors include St. Peter’s Health Partners, Ostroff Associates, Spectrum 8 Theatres, Open Stage Media, News Channel 13, Dunkin’ Donuts and Rensselaer Honda. A moment of silence will be held for the fallen too, before the hour-long walk finally begins at 10:15 a.m., being led by actual pancreatic cancer survivors. The Pipers expect the event to wind down around noon. Since its inception, the walk has gradually attracted more walkers, families, supporters and corporate sponsors, as well as raise an annual amount of around $120,000 in recent years. In 2017, it raised over $141,800 and attracted more than 500 walkers. As a result,the race has collectively raised over $958,815 since 2003 and The Pipers have just recently reached their goal of passing $1 million earlier this year. Neil said that during its first year in 2003, they raised just $3,200, which was still impressive, given that only 14 people attended. Five years after that, the first pancreatic cancer survivor appeared at the annual walk and eventually, there have been around seven who showed up every year by 2017. Hoping to continue the overall upward trend with this year’s race, the couple not only wants to raise more awareness about the cancer but also bring the community together. “We found that just getting people together is a really great thing because you share the feeling for the loss of a loved one in a common way, but also we get to celebrate their loved ones’ lives and we find that the walk raises money which is helping cancer research,” Neil said. Believing that research, which requires money, is the only way to battle pancreatic cancer, the couple also strives for early detection and universal screenings. The two noted that many people do not know much about the pancreas and its importance too, leading them to mostly take their bodies for granted and feel shocked when they eventually discover they have pancreatic cancer. The couple has also received a few calls annually too from concerned locals who are or have family members struggling with pancreatic cancer, and are asking for informational resources after hearing about the annual walk. Recalling that not as many people were aware of the severity of pancreatic cancer back in 2003, Lustgarten’s resources, the walk and its increasing number of annual sponsors, walkers and funds all collectively have since helped to try changing people’s mindsets about that. According to Neil, Lustgarten also can link a concerned local to sources for clinical trials and help them prepare to ask relevant questions to their doctors. “And you’ll support a very good cause,” Shari added.